Congratulations to Marvin King/Daisy Spitzer, 1st NS and Mark Boswell/Steve Zenk, 1st EW and to everyone else who placed. This was really fun and everyone had a good time. See you at the bridge table. 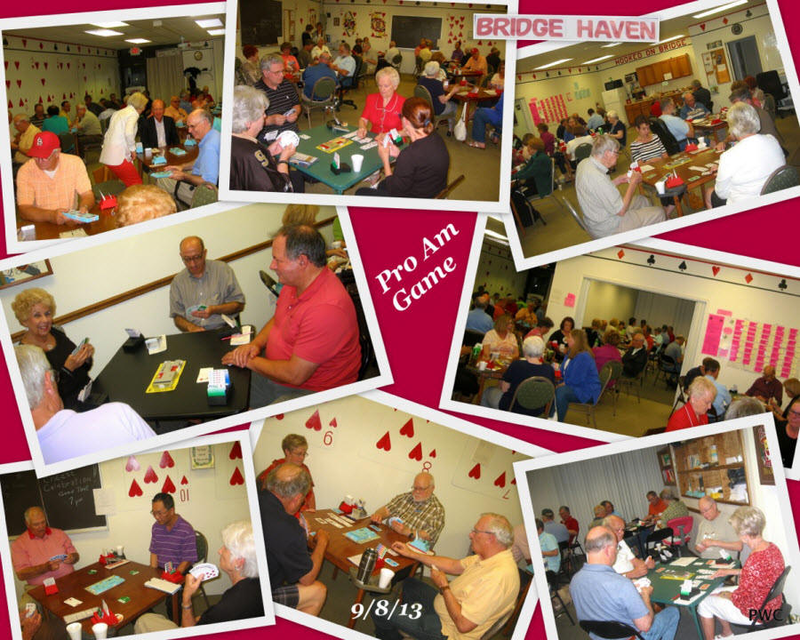 This year's Pro-Am charity game took place at Bridge Haven Club in St. Louis, MO on September 8, 2013. Chuck Starovasnik and Barbara Reid of Bridge Haven organize this yearly event. For the event, a "pro" is defined as a player with more than 2000 master points. It works like this. Several weeks before the event, the names of pros who volunteer are listed. People post bids for a particular pro. Winning bidders play with their "pro" at Pro-Am game. This year's event raised $7,127 for Backstoppers, a local charity that provides assistance to the families of St. Louis area police officers, fire fighters, and other emergency personnel who are killed in the line of duty. It's a success in two ways. The families served by Backstoppers benefit. And bridge players get a chance to play with top local players. In addition, some pros set up a "practice" game in advance of the event. So those lucky bidders get to play twice with their pro. A special thanks goes to these pros who donated their time and talent.